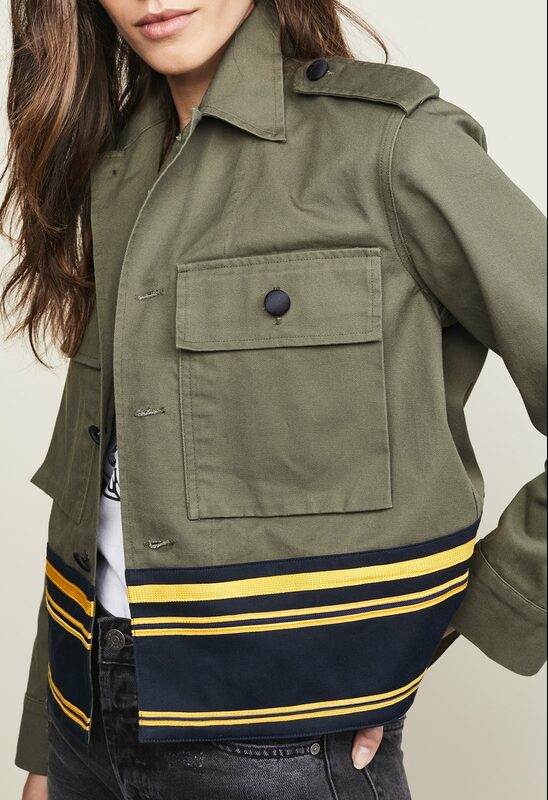 The stripes at the hem of this cropped jacket are so spiff, and I love how they contrast with the army green. 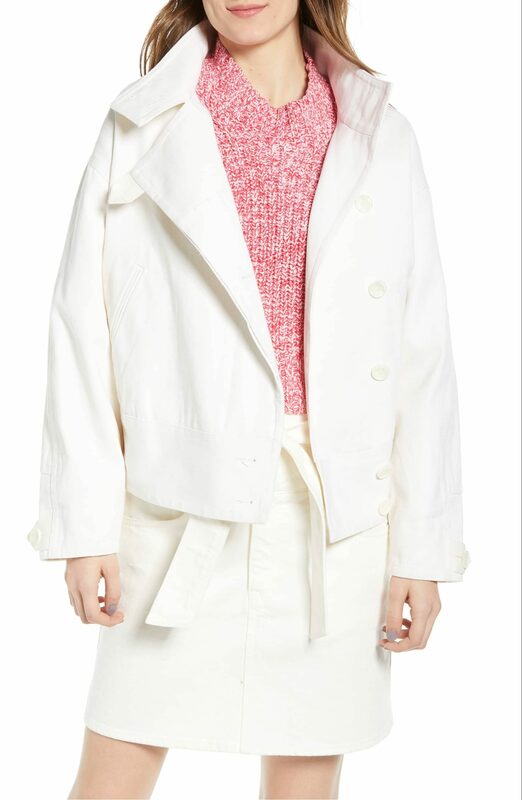 A slightly more feminine version of a utility jacket, in a lovely off-white hue. Meanwhile, I do like the idea of wearing a straightforwardly white jacket, and if I wasn’t constantly spilling things on myself, I probably would. I find the collar and lapel here very appealing. 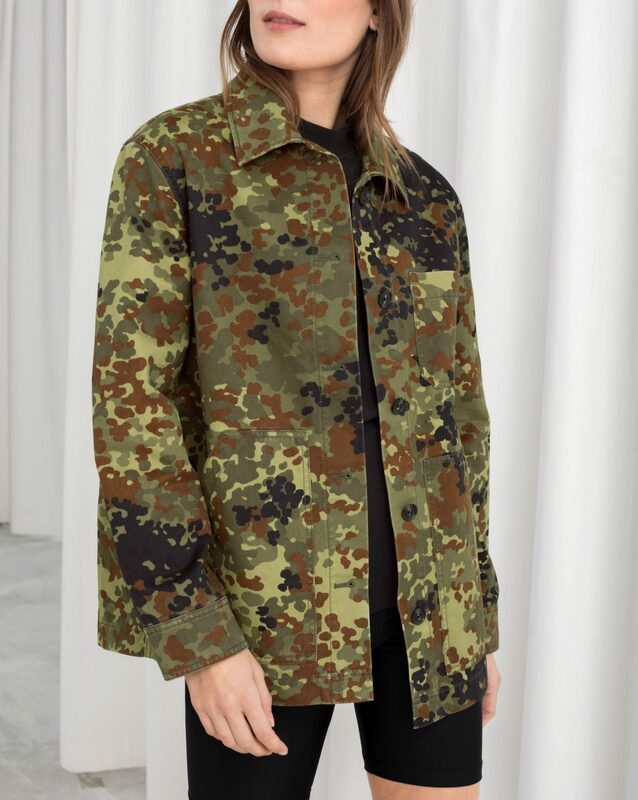 This looks like the kind of army surplus store jackets I remember being popular in the 70s. I like the crop, which isn’t too cropped, and the big patch pockets. 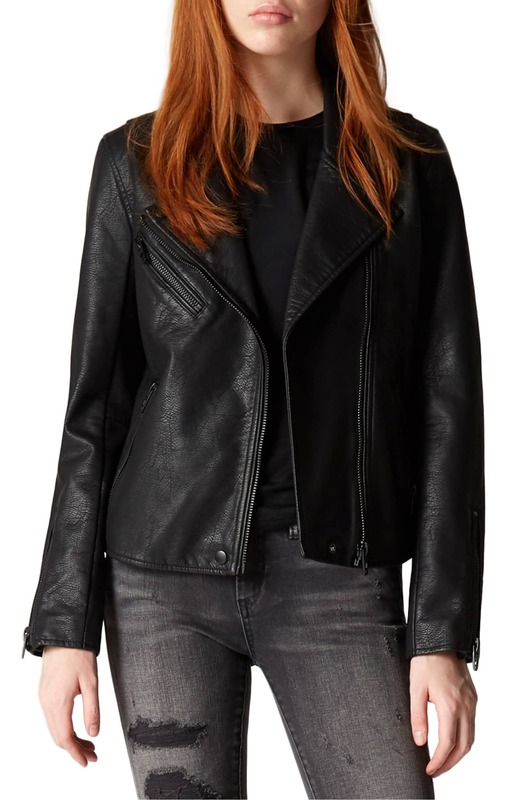 A well-priced faux-leather jacket that looks a great deal like the real thing. A slouchy indigo jacket perfect for running around town on the weekend. I am a fan of this classic camo number, and like how the snap closures update the look a bit. And here’s a really pretty great, more abstract camo print that is idling in my shopping cart even as I type. 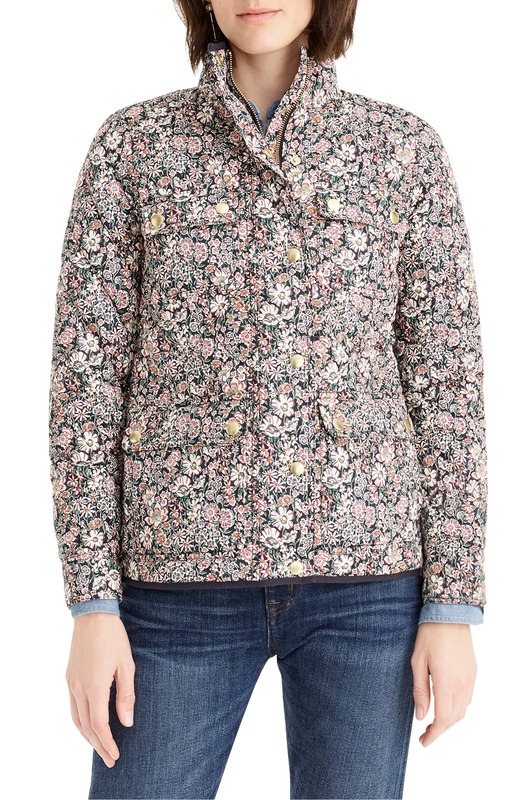 It’s J. Crew’s ever-popular Downtown Field Jacket, but all done up in a pretty excellent Liberty print. 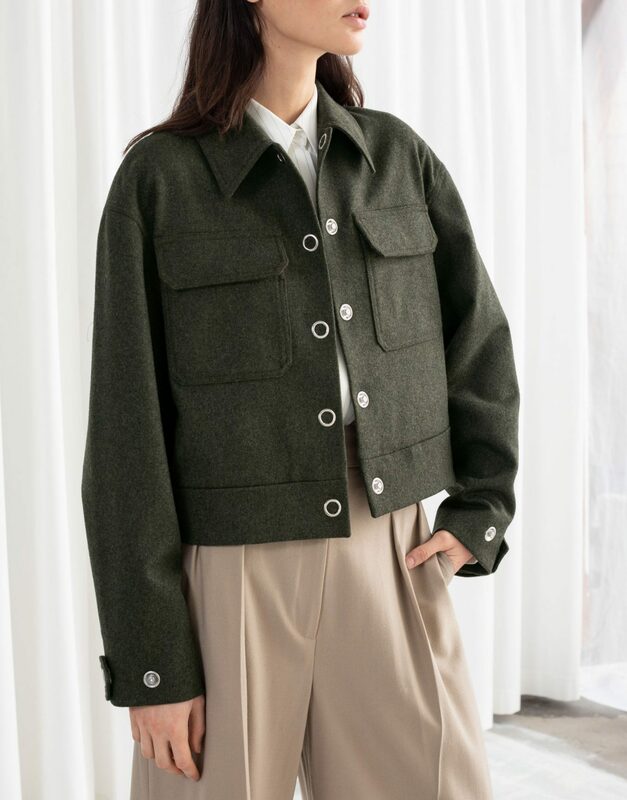 In spite of the patch pockets I am drawn to that Sezane jacket (although, full disclosure, I’d have to switch out those brown buttons!). And the Liberty print floral is something I will consider since I’m trying to break out of my non-floral habit––and it’s 40% off! Excellent suggestions here!! In spite of the patch pockets I am drawn to that Sezane jacket (although, full disclosure, I'd have to switch out those brown buttons!). And the Liberty print floral is something I will consider since I'm trying to break out of my non-floral habit––and it's 40% off! Excellent suggestions here!! At the risk of sounding like a broken record (or a paid shill), Whimsy & Row has a cream-colored chore jacket with subtler pockets and tortoise-looking buttons. 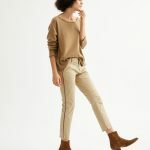 I skew “ethical” fashion (in quotes because I know it’s such a poorly defined term), and apparently all the brands got together and decided their target market wants chore jackets and high-waisted wide-legged pants. Which I do… but it’s unnerving to see the same silhouette repeated across brands, especially since one of the reasons I like the “ethical” brands is that I thought they were a little more original and off-beat. At the risk of sounding like a broken record (or a paid shill), Whimsy & Row has a cream-colored chore jacket with subtler pockets and tortoise-looking buttons. I skew "ethical" fashion (in quotes because I know it's such a poorly defined term), and apparently all the brands got together and decided their target market wants chore jackets and high-waisted wide-legged pants. Which I do... but it's unnerving to see the same silhouette repeated across brands, especially since one of the reasons I like the "ethical" brands is that I thought they were a little more original and off-beat. I’ve been on the hunt for a nice-looking faux leather jacket. Does anyone know of a good brand of faux leather? I’m fine with faux leather bags, but faux leather jackets always make me too hot/sweaty and faux leather shoes give me blisters. But maybe I’ve only tried cheap versions. Does anyone know of a good brand of faux leather? I'm fine with faux leather bags, but faux leather jackets always make me too hot/sweaty and faux leather shoes give me blisters. But maybe I've only tried cheap versions. So many splendid options in both part one & part two!! Did you hear that noise….wait…listen again…..
That is me screaming with joy over that Harvey Faircloth number. MY HEART!!!! Did you hear that noise....wait...listen again..... That is me screaming with joy over that Harvey Faircloth number. MY HEART!!!! All great jackets, but I would like to see more longer ones! I’m a fan of longer, too. 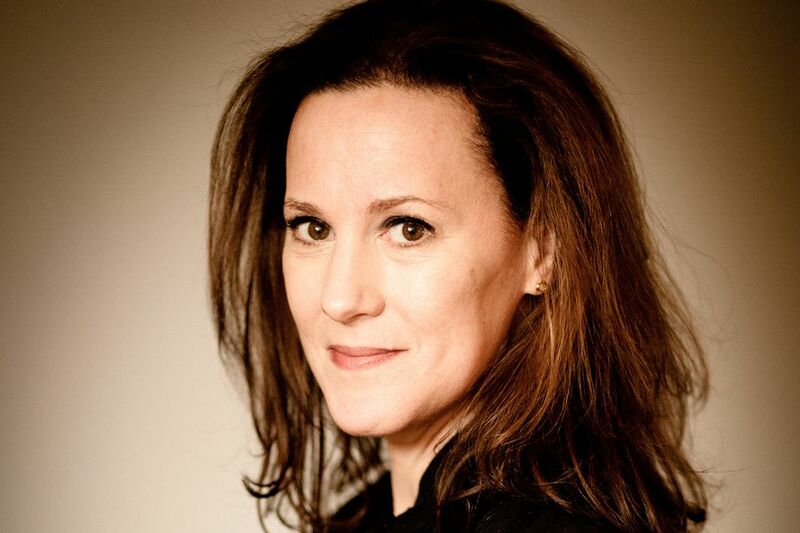 Short and boxy makes me look, well…short and boxy! 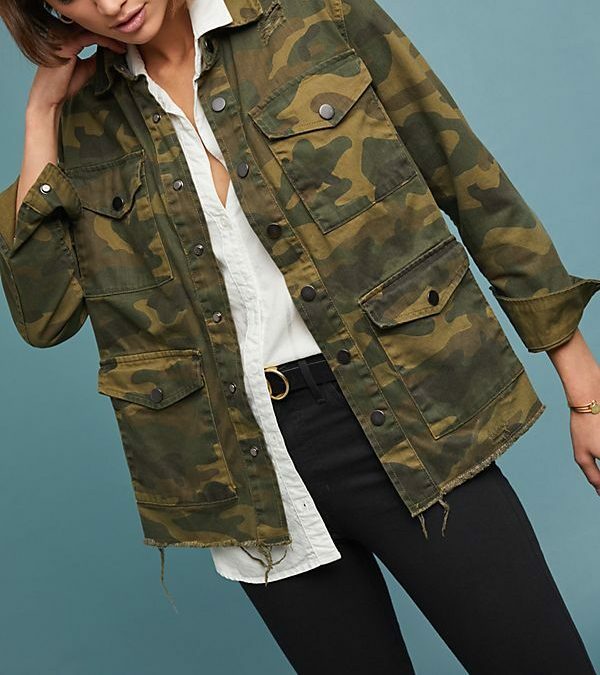 I do love the Sezane chore jacket, tho. I’m a fan of longer, too. Short and boxy makes me look, well...short and boxy! 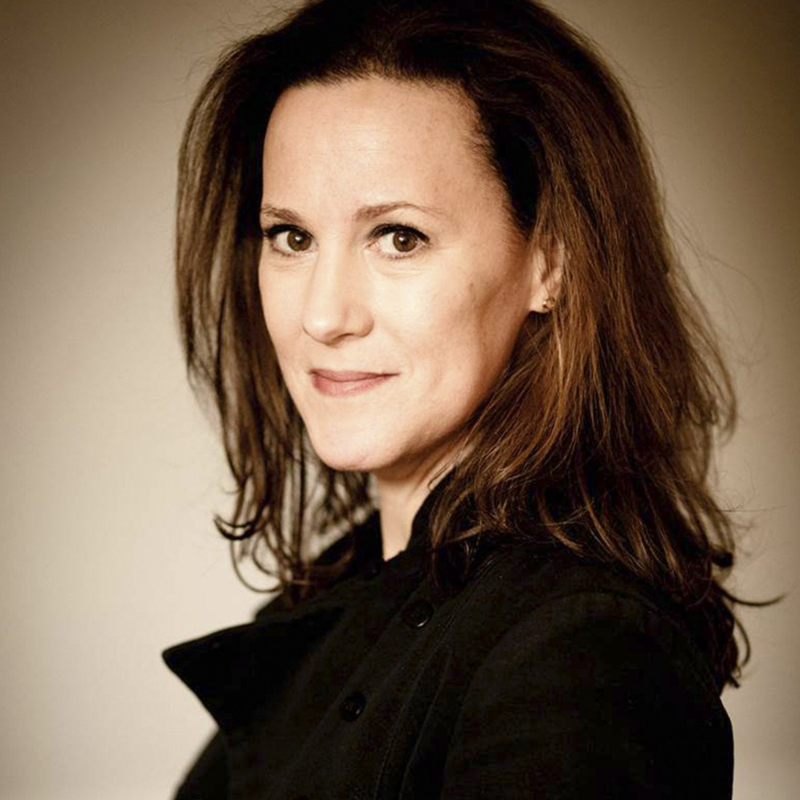 I do love the Sezane chore jacket, tho. My favorite is the & Other Stories army green wool Eisenhower jacket. Timeless! 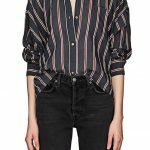 I love that it’s cropped and I don’t think it would be too boxy in a small enough size. I’m not sure about the silver snaps, but they might be less bombastic IRL, without a photographer’s bright lights shining on them. My favorite is the & Other Stories army green wool Eisenhower jacket. Timeless! I love that it's cropped and I don't think it would be too boxy in a small enough size. I'm not sure about the silver snaps, but they might be less bombastic IRL, without a photographer's bright lights shining on them.